RealCME is honored to be presenting two sessions and a poster at the Alliance’s 2017 Annual Conference. Information about each presentation is below. We hope you can join us! In an increasingly data-driven world, it is essential that CE for health professionals incorporate increasingly sophisticated statistical analyses into outcomes reporting. Unfortunately, this wealth of information is largely inaccessible due to the jargon-laden language we use to explain it. However, statistics can be a unifying (and universal) language, allowing a diverse audience (with varying levels of statistical knowledge) to understand the greater context and impact of an educational initiative. When you are able to communicate statistical findings in a way that is accessible and meaningful to a larger audience you provide the necessary stakeholders with data-driven grounding for future initiatives. This session will include an interactive workshop to encourage the discovery of lay analogs for statistical terms, through examples of explanations and visualizations that allow audience members of all proficiency levels to understand and participate in data-driven conversation. This discussion is meant to facilitate the democratization of statistics reporting in outcomes data. Simulation has a broad definition as “the imitation of a real-world process, situation, or system” and is utilized in a variety of ways in education, entertainment, testing, and scientific research. With the growing importance of system-based and patient safety education, and the penetration of value-based care reimbursement arrangements, simulation will likely become increasingly important in the education of health professionals. This session will review the simulation landscape as it’s been used in CME and the potential of simulation techniques being used outside of the health professional education community. Multiple case studies will be presented representing the use of simulation in K-12 education, higher education, industry/corporate training programs, and entertainment. The session will then move to an open-floor “simulation sharing” component, where participants will have the opportunity to share their own experience, or that of their organization, with educational initiatives utilizing simulation techniques. The goal of this discussion is to introduce the audience to the diverse applications and potential implications of including simulation techniques in continuing education and professional development. This initiative, a partnership between AXIS Medical Education (a medical education company), Optum One/Humedica (a health informatics company), and RealCME (an educational technology and analytics company) was intended to provide in-depth exploration of clinicopathologic issues and therapeutics and encourage a team-based approach across the care continuum. The program included two educational interventions utilizing RealCME’s flipped classroom instructional design, incorporating both synchronous and asynchronous components. The series was targeted towards the interdisciplinary team of healthcare professionals involved in the treatment of breast cancer. This CME/CE educational initiative included a Health Outcomes Study (HOS) featuring a group of clinicians from the Billings Clinic Cancer Center (Billings, Montana), as well as a control group of patient records from non-participant clinicians across the US. Data from the online activities were analyzed across multiple learning domains (knowledge, competence, confidence, and performance) and a predictive model assessing the relationship between the education and changes measured on compliance with specific treat-to-type protocols was produced. 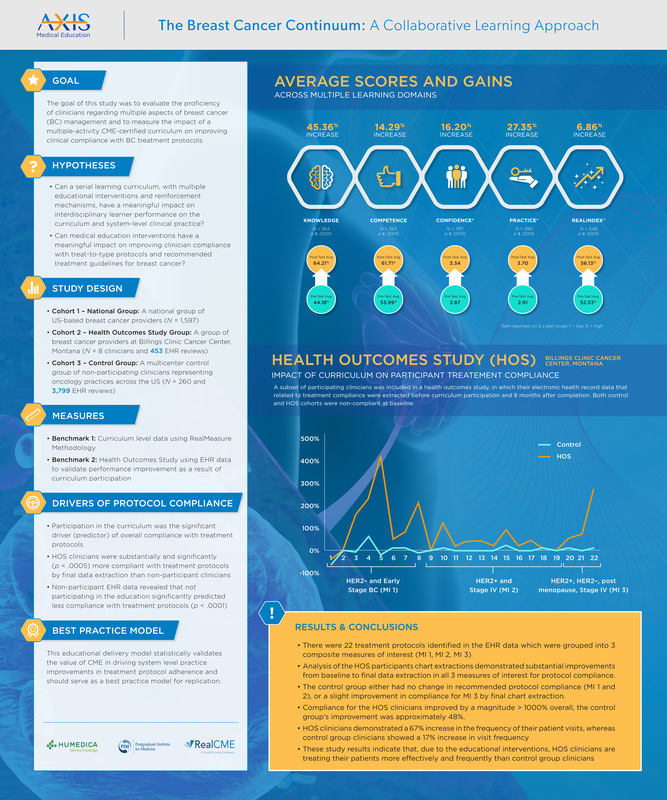 This program design leverages full denominator health record data to demonstrate the impact of a serial learning curriculum with multiple educational interventions and reinforcement mechanisms on clinical practice behaviors and patient outcomes.